Good morning. It gives me great pleasure to join you all at the Jumpstarter 2019. First and foremost, I would like to extend my warmest welcome to entrepreneurs and investors with us today, especially those coming from overseas. My special thanks also go to Alibaba Hong Kong Entrepreneurs Fund and the Chambers of Commerce for the successful launch of this prestigious platform for showcasing quality start-ups and providing high-impact networking opportunities. Jumpstarter aims to build, empower and boost Hong Kong's start-up ecosystem and entrepreneurship by bringing entrepreneurs, corporates, investors and the public together, helping to transform Hong Kong into a leading hub for global innovation and technology (I&T). This echoes well with the policy objective of the current-term Hong Kong Special Administrative Region (HKSAR) Government in developing an inspiring environment conducive to I&T, with a view to creating new industries and wealth, providing more employment for young people, promoting upward mobility and improving people's livelihood. Capitalising on our advantages under "one country, two systems", strategic geographical location, established legal system, robust protection for intellectual property, highly efficient financial platforms and world-class universities, with four of our universities among the world's top 100, Hong Kong has gained a solid footing in driving I&T growth. Indeed, President Xi Jinping has openly indicated that Hong Kong has a solid science and technology foundation and a strong pool of quality technology talent, and pledged to support the development of Hong Kong into an international I&T hub. Looking forward, the development of the Guangdong-Hong Kong-Macao Greater Bay Area and collaboration between Hong Kong and Shenzhen will connect the upstream, midstream and downstream sectors of innovation and technology industries, thereby developing an international I&T hub in the Greater Bay Area. The immense synergy effects so generated will provide powerful support for Hong Kong's I&T ecosystem to thrive. To propel our I&T development forward, in the past three years alone, the HKSAR Government has committed over HK$100 billion to boost research and development (R&D), develop state-of-the-art I&T infrastructure, nurture I&T talent pool, provide investment funding and support measures to improve the ecosystem for startups. A vibrant startup environment plays a pivotal role in driving I&T development in Hong Kong. Hong Kong's start-up scene has experienced phenomenal growth in recent years. We are ranked among the top five fastest growing start-up ecosystems and one of the world's top 25 start-up hubs. According to the latest survey results, there were over 2 600 start-ups in Hong Kong in 2018, up by 18 per cent over 2017. The number of people employed by start-ups also skyrocketed to 9 548, an increase of 51 per cent over the previous year. The HKSAR Government is determined to transform Hong Kong into a leading global hub for innovation and entrepreneurship where start-ups can use the city as a lab, a showcase and a global launch pad. We have introduced a series of measures to create a conducive ecosystem with state-of-the-art infrastructure and supporting facilities, heavy financial support and a full range of supporting services to nurture start-ups throughout their journey from conceptualisation to commercialisation, thereby enabling them to develop their ideas and create revolutionary new tech products and services. Our two flagship I&T institutions, namely the Hong Kong Science and Technology Parks Corporation (the manager of the Hong Kong Science Park) and Cyberport, fuel the growth of I&T startups by connecting all elements of the value chain, from innovative thinking, research and development and creative design to production. The Science Park offers three incubation programmes targeted for start-ups in the fields of new technology, biomedical technology and web and mobile technology. The HKSAR Government further provided additional allocation of HK$7 billion to the Science Park to launch the Enhanced Incubation Programmes last October to strengthen support for its tenants and incubatees. 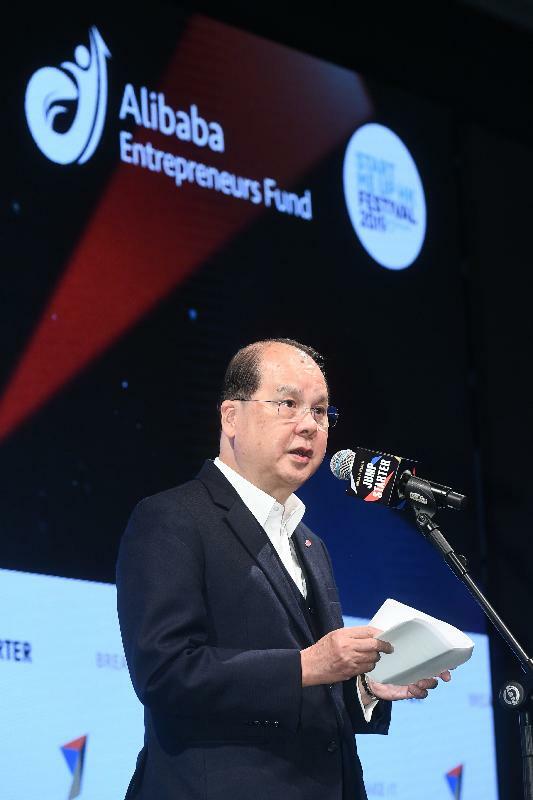 As for Cyberport, it runs a number of programmes to boost the growth of start-ups in Hong Kong, including the Cyberport Creative Micro Fund, the Cyberport Incubation Programme and the Cyberport Macro Fund, among others. Recently, Cyberport has launched the Overseas/Mainland Market Development Support Scheme to provide financial support for Cyberport programme graduates to explore new opportunities in markets on the Mainland and places overseas. To encourage venture capital investment in local I&T start-ups, we have introduced the HK$2 billion Innovation and Technology Venture Fund to attract private venture capital funds to co-invest with the HKSAR Government in local I&T start-ups on an investment ratio of about 1:2. In just seven months since the launch of the Fund in last July, we have already partnered with six venture capital funds and started receiving their invitations. On pooling of technology talent, we have allocated HK$10 billion to support the establishment of two research clusters on healthcare technologies and on artificial intelligence and robotics technologies, to attract the world's top scientific research institutions and technology enterprises to Hong Kong for conducting more midstream and downstream R&D projects in collaboration with local universities and scientific research institutions. Such clusters will pool and nurture more technology talent in Hong Kong. 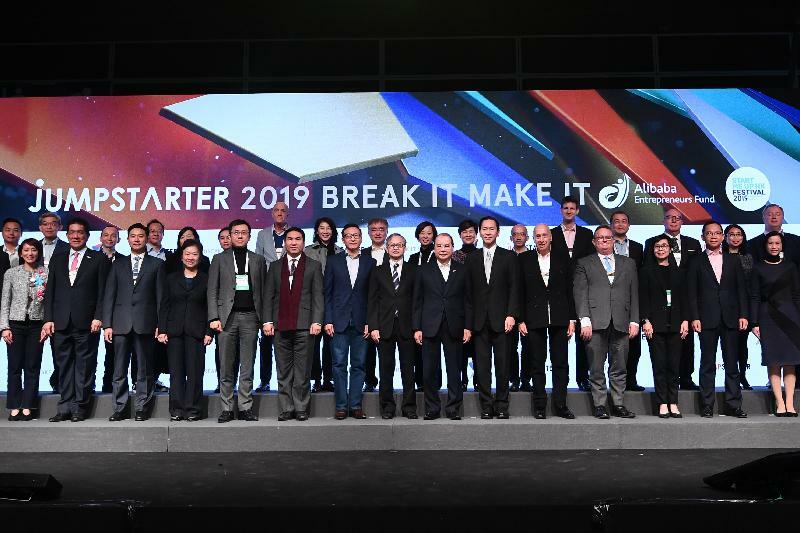 Ladies and gentlemen, the Government's investment promotion agency, Invest Hong Kong, has launched the StartmeupHK programme since 2013 to attract innovative and scalable entrepreneurs to Hong Kong and promote Hong Kong as a premier startup destination. It also provides a one-stop service platform to support start-ups and help build our ecosystem to transform Hong Kong into an attractive destination for entrepreneurs from around the world. The annual flagship event, the StartmeupHK Festival, attracted over 6 000 participants last year. This year, the Festival is also held this week, starting from this Monday (January 21) until 29 January 2019. Today's Jumpstarter event for sure is a highlight and icon of this "festive week". However, Government's efforts alone are not enough. We need the support of the industries and practitioners like Alibaba to join hands to help cultivate a fertile ground for start-ups in Hong Kong to "jump start" and stand amongst the world's best, I am most pleased to learn that Alibaba Hong Kong Entrepreneurs Fund is providing enormous support to start-ups through various schemes and incubation programmes. On this note, I wish the Jumpstarter 2019 and StartmeupHK Festival a tremendous success and, for guests coming from abroad, a pleasant stay in Hong Kong. Thank you very much.